L-R: Jeff Smarse, Natalie St. Cyr, Meaghan Johns, Seth Zeigler, Katelyn Griggs, Colleen Thomas. Not pictured: Samantha Pasciuto. 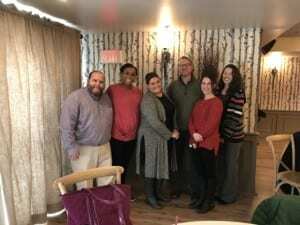 Last week we introduced you to Network4Health (N4H)’s Care Transitions Team in Greater Manchester, New Hampshire: a team of social service practitioners working with a caseload of Medicaid beneficiaries who experience behavioral health disorders or are at risk of experiencing a behavioral health disorder and are facing a variety of important life transitions. Clinical Director, Meaghan Johns LICSW, and her team (pictured here) describe some of the challenges and successes of implementing CTI in their work. CACTI: What have been some of your biggest challenges implementing CTI? N4H Care Transitions Team: Engaging clients once they are back in the community can be challenging due to unstable housing, lack of phone, and chaotic nature of their lives. Transition Coaches have been working hard to build trust and develop working relationships with clients prior to discharge from facilities during “pre-CTI phase” to mitigate some of those connection challenges. Fostering referrals has proven to be challenging as well. As CTI is new to NH, N4H’s Care Transitions Team has been busy meeting with different community members and organizations to get the word out and encourage referral to our team. CACTI: How about any meaningful strides or successes that you have celebrated thus far? N4H Care Transitions Team: Our very first referral has been our biggest challenge and biggest success. “John” had been in the hospital for close to 10 weeks and was resistant to discharge due to overwhelming stressors and physical needs at home. He was grateful when CTI services were offered and was able to transition successfully back to his apartment in the community. Within just a few short weeks his coach was able to secure in home health care and visiting nurse services to help him be successful at home. We have been told that several providers had been ready to terminate client’s services due to frequent no shows and lack of engagement. CTI was able to teach client how to access and utilize transportation services to get to his appointments. The client as well as his doctors and therapist have all been pleased with how CTI and the Care Transitions Team have been able to address social determinants that unaddressed create stress vulnerability, leading to increased behavioral health symptoms and need for higher levels of intervention.